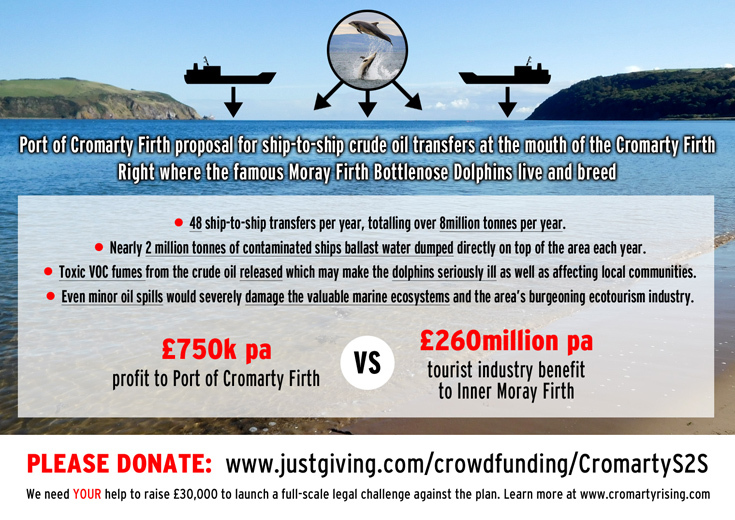 'Cromarty Rising' is launching a full-scale legal challenge to the Port of Cromarty Firth's plan for ship-to-ship crude oil transfers at the mouth of the Cromarty Firth - right where the largest colony of Bottlenose Dolphins in Europe lives and breeds. The Port of Cromarty Firth is continuing its application for ship-to-ship crude oil transfers at the mouth of the Cromarty Firth - right where the Moray Firth Bottlenose Dolphins live and breed. - Nearly 2 million tonnes of contaminated ships ballast water will also be discharged directly on top of the area each year inevitably damaging the marine habitat and the species which live there. - Toxic VOC fumes from the crude oil will be released which may make the dolphins seriously ill as well as affecting local communities. - Even minor oil spills would severely damage our valuable marine ecosystems and the area’s burgeoning ecotourism industry.